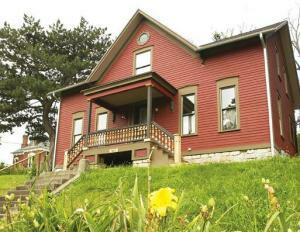 Abandoned houses are becoming homes again in Davenport. Eleven houses have been rehabilitated through Davenport’s Housing Assistance to Preserve and Protect Our Established Neighborhoods, or HAPPEN, program. Three are owner-occupied, and construction has been completed on the eight others. allocated to projects since HAPPEN began in 2005. To get the full rebate, rehabilitated properties cannot be used as rental property for five years. Gateway Redevelopment Group wants to be part of the solution to the abandoned housing problem, especially in central Davenport, said Jack Haberman, the group’s president. Gateway is close to closing the sale on a house at 822 Gaines St., which was at the top of a demolition list of abandoned properties. “We can’t afford any more empty lots in our neighborhood,” he said. “It is paramount to our survival. Graf said most of the houses in the program, like the one on Gaines Street, are in the central part of the city, but Jan and Dennis Whittington took on one in the 2900 block of West 49th Street. When the house was discovered, vandals had knocked in walls, the plumbing had some pipes that had burst and animals lived inside. Despite the house’s ramshackle nature, the Whittingtons saw its potential, including a two-sided fireplace, an intercom system, built-in aquariums and a central vacuum system. That is typical for people willing to take on an abandoned property, Graf said. To be eligible, properties have to be vacant for six months and have significant electrical, plumbing or structural code violations so that property owners cannot move in immediately. The city has 80 to 85 properties on its abandoned housing list. Repairing them is not cheap. Along with the HAPPEN program, homeowners also may be eligible for other grant funding, such as a historic property grant, she said. Finding an abandoned house or having the good intentions to rehab one is not enough to qualify for the rebate, said Greg Rediger, who serves on the abandoned housing task force. Applications have been rejected for a number of reasons, including being incomplete or not having financing arranged, Rediger said. He thinks the program will grow as more people learn about it.